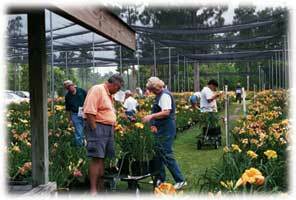 Roycroft Daylily Nursery, located 39 miles south of Myrtle Beach and, 57 miles north of Charleston, is a container-grown daylily nursery and an official AHS (American Hemerocallis Society) National Display Garden. 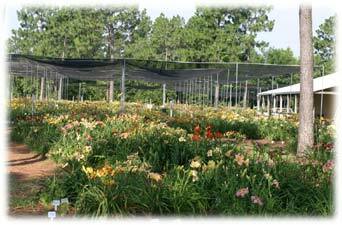 We would be honored by your visit to our nursery to view our display beds and container-grown daylilies. It would be our pleasure to be of service to you. Nursery open hours vary throughout the year; you may find our current hours of operation given on our home page. Our continuous goal is to grow 600+ daylily cultivars of the highest qualities (from the 65,000+ registered cultivars developed by many hybridizers) and offer those of which we have adequate stock to our world-wide customers. We both add and discontinue cultivars annually in order to try our very best to stay on the "cutting edge" in the world of daylilies! We have 20 raised AHS Display beds with each cultivar labeled on metal markers and giving the hybridizer's name. The beds are irrigated, well fertilized, and mulched with pine straw. We admire the many hybridizers who are represented in our Display Garden and present their introductions to the best of our ability for the benefit of our customers, the general public, the hybridizers, and AHS Garden Judges who frequent our Nursery and AHS Display Garden. Thanks to you who visited our Official American Hemerocallis Society Daylily Display Garden and container daylily Nursery this past year. Our lounge has a restroom, water cooler, TV, computer, and a vast photo gallery that is displayed on the walls. Tagalongs like to "hang out" in the air-conditioned lounge with other tagalongs. Many of our customers like to walk around with our easy-to-pull heavy-duty wagons and select their own container-grown plants. This is simplified by our coded location system. Thanks to our mail-order customers for your continued support! Should you be dissatisfied with your daylilies when you open the box please call us on our toll free number and we will instruct you on returning for a refund. 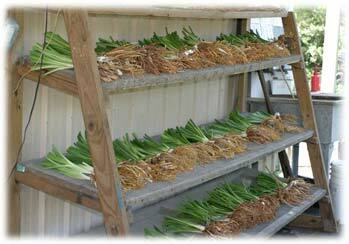 Daylilies are shipped from April through October. Please specify your desired shipping date. We put top priority on shipping. Even so, the earlier you place your order the better your chances of shipment on your specified date and our not being "sold out" of that special daylily you want. Our reputation hinges on shipping quality daylilies as promptly as possible! 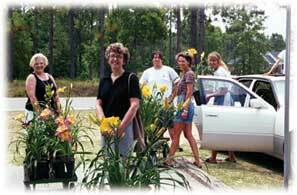 We encourage you to consider sending daylilies or gift certificates to family and friends for special occasions. Daylilies are much appreciated gifts which will be enjoyed for many years!!! Rowland Alston (second from left), host of the TV program "MAKING IT GROW", interviews Bob Roycroft Sr. in late September, for a program which included images featuring late blooming cultivars.